A halved papaya on a wooden table. 4 Is Papaya Good for Facial Skin? Papayas have properties that can put the annoyances of acne to rest. The plaguing problem arises from an overproduction of oil in the skin; the body naturally produces sebum to keep skin hydrated, but excessive amounts can block cells and trap hair and dead skin cells in pores. Clogged pores become pimples. The enzymes, vitamins and lycopene in papayas help battle blemishes. 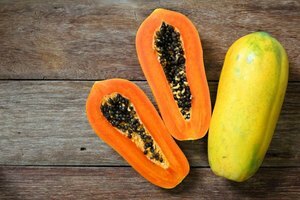 Papaya’s enzymes -- papain and chymopapain -- possess antifungal, antibacterial and antiviral properties. Papain is a protein-dissolving enzyme. Skin is composed of proteins; acne-assailant papain breaks down and removes damaged keratin proteins without harming healthy tissue. The exfoliating enzyme unclogs pores by dissolving dry, dead skin cells. It not only purifies pores but also boosts the production of new, healthy cells and acts as an anti-inflammatory agent to keep skin smooth. The vitamins in papayas help blot out blemishes. Antioxidant vitamin A topically treats acne by reducing inflammation and soothing swollen, sore and red spots. It also maintains skin's clarity; vitamin A strips pores of dead skin cells, which can accumulate to cause a breakout. Beta-carotene, a type of vitamin A, promotes healthy skin. Papaya’s dose of vitamins B and C decreases acne-antagonized inflammation and redness, and reduces the skin’s oil production by trapping moisture in the skin. The fleshy fruit’s richness in color is in part due to its lycopene content. Lycopene in papayas promotes anti-inflammatory and antioxidant activity, which shields the skin from environmental factors that can clog pores and cause breakouts. Papayas also contain skin-lightening properties and can help erase red acne splotches. For the lucky ones, applying the juice of unripe papayas to the skin for 15 minutes and then cleansing with cool water can reduce acne. For the less fortunate, papaya can cause allergic dermatitis or respiratory problems. The milky sap of papaya is laden with latex, which can spark an allergic reaction. Refinery 29: Lycopene: What It Is, and Why Your Skin Needs It!